The kids are back to school, and pears are ripe. Does it get any better? 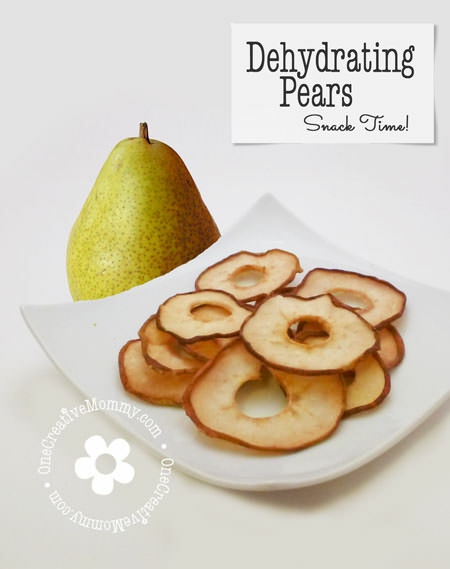 Not only are pears my absolute favorite bottled fruit, but dehydrated/dried pears are one of my favorite treats. I’ve spent the day drying pears, and tomorrow I’ll start making fruit roll ups (aka fruit leather) with the pears that are too ripe to dry. I bet you want to know how to do it, right? This is one of those super easy recipes that is really difficult to mess up. Because the dehydrator will get rid of any extra liquid you might add by mistake, no amounts need to be exact. If you plan to store your fruit roll ups for a long time, you can add some honey. It is supposed to keep the roll ups from going brittle. Since mine are always eaten quickly, I have stopped adding the honey. Both flavors are yummy, but I like them best without honey. Prepare your apples by coring and cutting them into quarters. You do not need to peel the either fruit, but you can if you’d like. 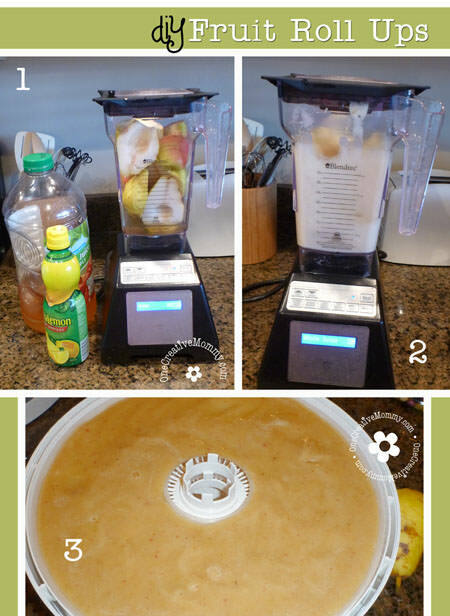 Fill the blender cup 3/4 full with pears and one apple (quarter or half the fruit first). The apple and pear blend is yummy, but you can omit the apple if you’d like. I filled my blender way too full, but it still worked. Push the whole juice button, or just blend until it reaches a soupy consistency. The fruit leather will darken fairly quickly. Once dried (it will no longer feel super sticky to the touch), lay out a large sheet of plastic wrap on the counter. Gently peel the fruit from the tray and lay it on the plastic. Cut through the plastic and the fruit to the center, creating pie slice shapes. Roll the slices from the center out, using the extra plastic around the edges to hold the rolls closed. These can be stored in the fridge, but my kids never let them last more than a month or two, so I usually just keep them in the cupboard. My kids–even my picky ones–are gobbling these like crazy! It’s so nice to see them eating something with no added sugar and loving it! (I used to add honey to keep the rolls from going brittle, but I forgot this year, and they were just fine without it. I think they actually tasted better. Thanks for stopping by. I hope you’ll share this post in some way! Click here to see the places where I have been known to link up my projects and recipes. We are huge fans of fruit roll ups. We haven’t tried pears yet, so this will have to be next. I like pears and apples in fruit roll ups because they don’t need added sugar. I haven’t ever tried other flavors. I bet you could pop any fruit in this mix, and it would be yummy. (Most fruit strips are made with a pear base, anyway.) Good luck if you try this, Brenna. We have done banana and apple which are great, I don’t know how we missed pear. My husband has even used yogurt before, and it was awesome. Linked. Thanks for the invite! Oh yummy! These actually LOOK good. 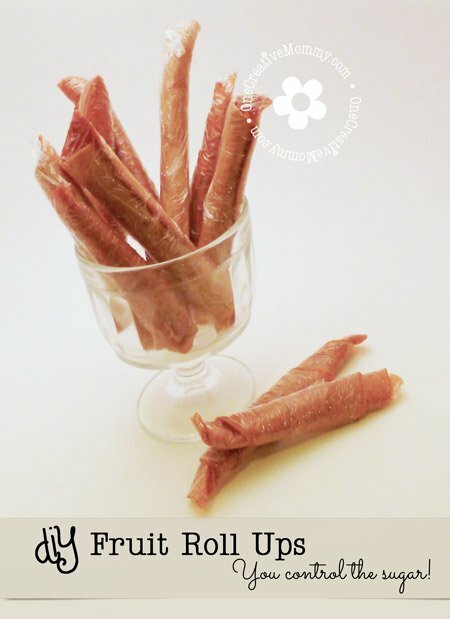 Can’t tell you the number of “roll up” type attempts I’ve seen that look scary to eat! Going to have to borrow a dehydrator from a friend and try these. Thanks for sharing! Thanks, Sasha. The pic of the liquid on the dehydrator is what the roll up looks like before it dehydrates. It is much darker once it’s done. Since there is no added color in homemade fruit roll ups, the color of most flavors is brown or dark orange (the natural color of most dried fruits). Lemon juice helps a little, but don’t be surprised when your fruit roll gets really dark and ugly! Looks aren’t everything, right? I think these look and taste great. Good luck, and thanks for stopping by. I’m headed over to your site now. I tried making fruit leather for the first time this summer, using our abundance of juicy plums. It turned out to be brittle, but tasty. Maybe I’ll do some with pears, too! Try adding honey instead of sugar to your recipe next time. It’s supposed to keep the leather from getting brittle. (Mine’s never lasted long enough to find out if it’s true!) Thanks for visiting. These look great! Makes me miss the fruit roll ups my grandma used to make when I was little. I found your post via Shaffer Sisters. Have a great day! Thanks, Melanie. They taste just like my grandma’s. I just popped over to your site. I’ve heard about these but I’ve never made them myself before. What a brilliant way to make healthy snacks! Thanks, Nicky. I’m all linked up! These look delicious. I keep thinking I should get a dehydrator – will have to remember this for when I eventually do! I hope you get one, Zoe! I love mine. Thanks for visiting and commenting. I’m off to visit your site. Thanks, Julie. I love your back-to-school theme! What is a dehydrator? Where do u get it from? A dehydrator is an appliance that slowly heats the food to dry it out. I added a link near the end of the post that will show you where to buy one on amazon.com. i gather unripe pear before the animals can get to them .LAST YEAR WE WERE NOT ABLE TO SEE ANY PEARS ripened bec. those rodents ate all of them while on the tree,so i decided to take them off the tree and try to preserve them. Any suggestion on how i can use them for roll ups, pies,canning or whatever? Hmm, Cristina. If the pears aren’t ripe, I’m not sure what you can do with them. 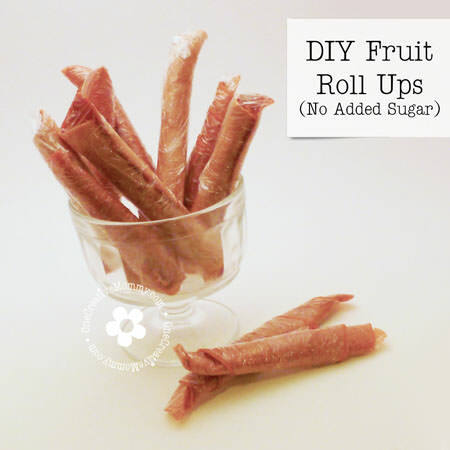 If you have a way to let them ripen, then you should be able to dry them, make roll ups, or bottle them. You could even make pear sauce. All of those options require that the pears be ripe, though. I’d try googling how to ripen pears. Sorry I can’t be more help! The deer eat my tree before the pears can even grow! They like the new shoots.